We consider nanosecond subterahertz waveguide switches based on a 3D resonator with an active element made of a semiconductor, whose conductivity is controlled by a laser. Recently discovered possibilities to use these switches to obtain pulses with very long durations (up to tens of seconds) along with nanosecond pulses in one and the same device prototype are discussed. 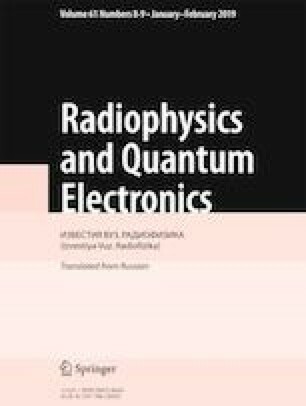 Switching with no distortion of the coherent radiation of promising subterahertz gyrotrons, which have powers of about several watts and pulse durations of up to ten seconds are demonstrated experimentally. The theoretical estimate of limiting powers of the switched subterahertz waves, which was proposed earlier, is confirmed and generalized. For this purpose, we perform a measurement of the powers by reducing it to a trivial measurement of the power of radiation of an industrial IR laser. Improvement of the resonance characteristics of the developed switch after switching several sequential long subterahertz pulses has been revealed. Most probably, it is due to “burning-off” of microscopic manufacturing defects and the approach of the actual frequency-amplitude characteristic to the calculated one. It has been predicted theoretically and partially confirmed experimentally that it is not possible to disable the switch being in the fundamental equilibrium state upon switching arbitrarily high powers of subteraheratz waves near the resonance band. Translated from Izvestiya Vysshikh Uchebnykh Zavedenii, Radiofizika, Vol. 61, No. 8–9, pp. 677–689, August–September 2018.